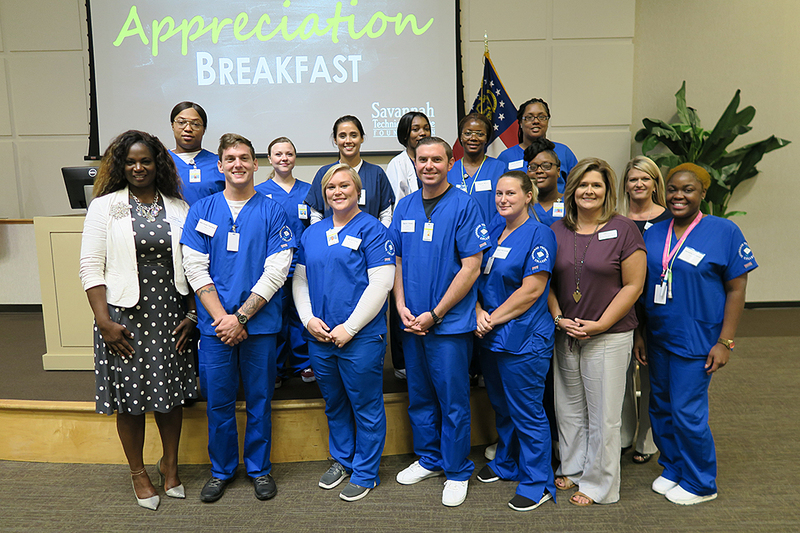 SAVANNAH, Ga. – The CHSGa Practical Nursing Scholarship is an opportunity for Savannah Technical College students in the Licensed Practical Nursing (LPN) program thanks to a fund created by CHSGa. CHSGa, a non-profit healthcare system, gave STC’s Foundation $6,000 to provide scholarships to qualified students enrolled in the LPN program. “By providing the CHSGa Practical Nursing Scholarship we are assisting students who are committed to the healthcare profession and future workforce,” states Ronnie Rollins, President and CEO of CHSGa. CHSGA established their Practical Nursing Scholarship in support of students in the diploma program in pursuit of entry-level careers. The scholarship is open to LPN students, upon formal admission, during their first term of study upon satisfactory completion of all requirements. LPN students are required to submit a 200-word essay that speaks to student character and their commitment to nursing. Funds aid students in the cost for tuition, books, supplies and any other related educational expenses. Licensed practical nurses (LPNs), under the direction of physicians and registered nurses, care for people who are sick, injured, convalescent, or disabled. Program graduates receive a practical nursing diploma and have the qualifications of an entry-level practical nurse. Employment of LPNs is projected to grow much faster than average. Overall job prospects are expected to be very good, but job outlook varies by industry. The best job opportunities will occur in nursing care facilities and home healthcare services. Savannah Technical College offers the competitive-admission LPN program at the Savannah and Liberty campuses. For more information about Practical Nursing, contact STC Health Sciences Advisor Cindy Cole at 912.443.5721 or ccole@savannahtech.edu. CHSGa is a non-profit healthcare system working with service delivery lines that provide skilled nursing care, hospice care, home health services, transitional care services, acute care, rehabilitation therapy, pharmacy services, medical supply distribution, mobile imaging, and emergency transportation services. For information on establishing a student scholarship or supporting the STC Foundation, please contact STC’s Executive Director for Institutional Advancement and Communications Gail Eubanks (geubanks@savannahtech.edu or 912.443.3022).